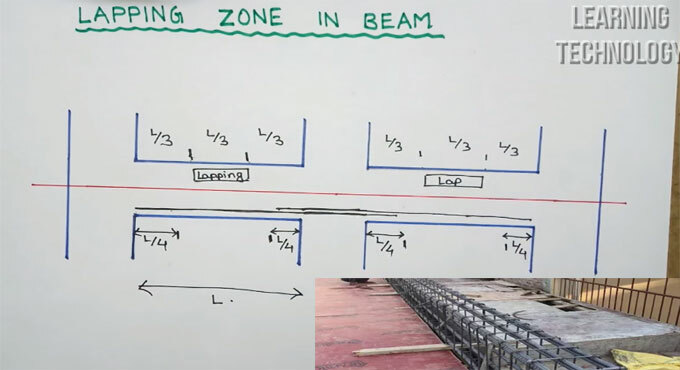 In this construction video tutorial, the eminent engineer Mukesh Shah, briefly explain the reinforcement lapping zone in beam. Top reinforcement in beam is lapped at mid span since the beam does not undergo any negative moment at midspan and so lapping is ideal in that area. For bottom reinforcement, it is lapped adjacent to the ends and the similar concept is used further because there does not exist any positive moment at the ends of the beam. The perfect zone for lapping is where the moments remain zero for continuous beams or in the bending moment diagram, where the values surpass the x-axis or remain at L/4 for simply supported beams. The lapping should be provided on tension zone as moments will be created with greater tension. To learn the detailed process, go through the following video tutorial.